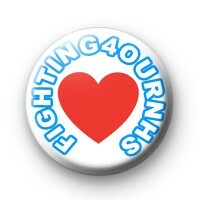 A white button badge with the text Fighting for (4) our NHS written around the edge in blue and white NHS inspired font. Also has a large red heart in the middle. This badge was designed for nurses taking part in a protest rally against NHS hospital funding cuts. Perfect for doctors and nurses to wear to show their support for our wonderful health care system in the UK. Standard 25mm badge made by hand in our UK workshop. We have a great range of badges for nurses & doctors including a lot of NHS support badges.